Jaipur Development Authority has all set to announced the lottery draw result of JDA new residential plot and flat scheme 2016 for the allotment of 3107 housing units. Today, JDA will conduct a lottery for the allotment of 3107 flats and plots under affordable housing policy and Niji Khatedar scheme. 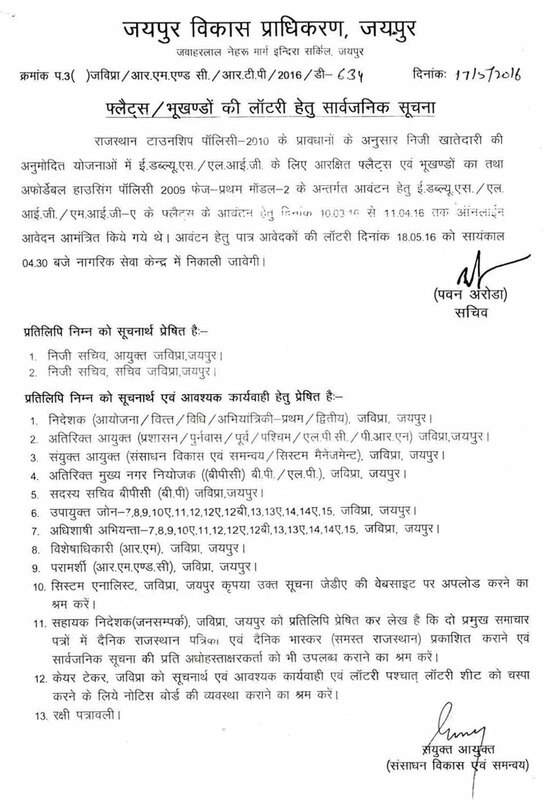 JDA has published a notification for conducting a lottery draw of the scheme. In this scheme, flats and plots were available for EWS and LIG category under Rajasthan Township Policy 2010 and under Affordable Housing Policy 2009 Phase-I Model-2, affordable flats were offered to EWS, LIG and MIG categories of the society. Applications for the scheme were invited from 10 March 20146 to 11 April 2016 and within the registration period, JDA received big bunch of application forms from the people. The lottery draw result for JDA new housing scheme 2016 will start today at 4:30 PM in Citizen Service Center and the list of successful applicants in the lottery draw result will be available by late evening or by morning on the official website of JDA. For more details visit the official website of JDA jaipur.